Speedrunners and glitch hunters are exploiting the game’s oddities to finish in less than 5 minutes. Brad Myers is no stranger to the Mushroom Kingdom. On nearly 22,000 recorded occasions, he’s inhabited the character of an 8-bit, suspendered plumber named Mario. Each time, he sprints left to right across the kingdom’s psychedelic landscape, going down its pipes and through its castles in an attempt to rescue Princess Toadstool faster than anyone ever has before. 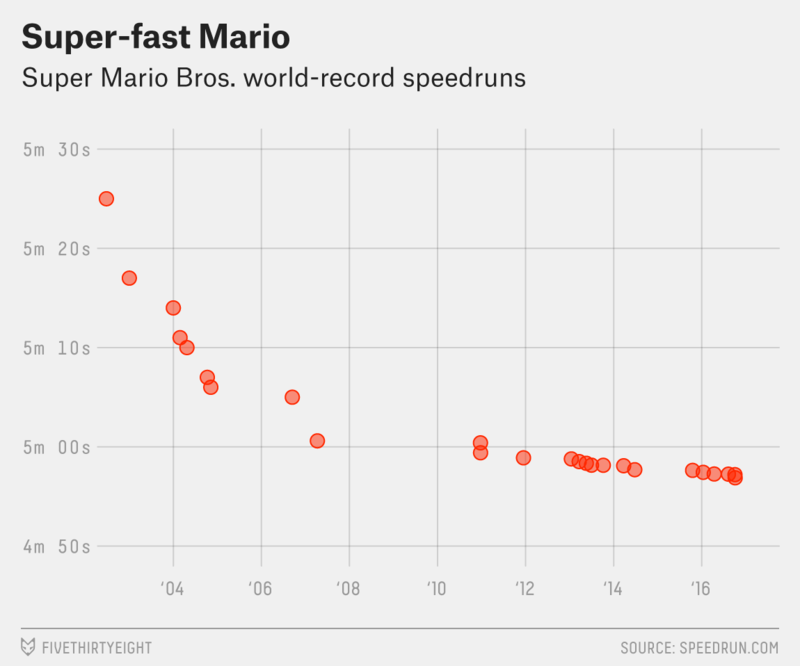 Myers — or darbian, as he’s known online — holds the current Super Mario Bros. speedrun world record of 4 minutes, 56.878 seconds, set earlier this month at his home in southwestern Virginia. He’s a prominent figure in the world of speedrunning, where players sprint through games from Astro Boy to Mario to Pokemon to Zelda, calling upon their deep knowledge of the games’ intricacies to beat them as quickly as humanly possible. 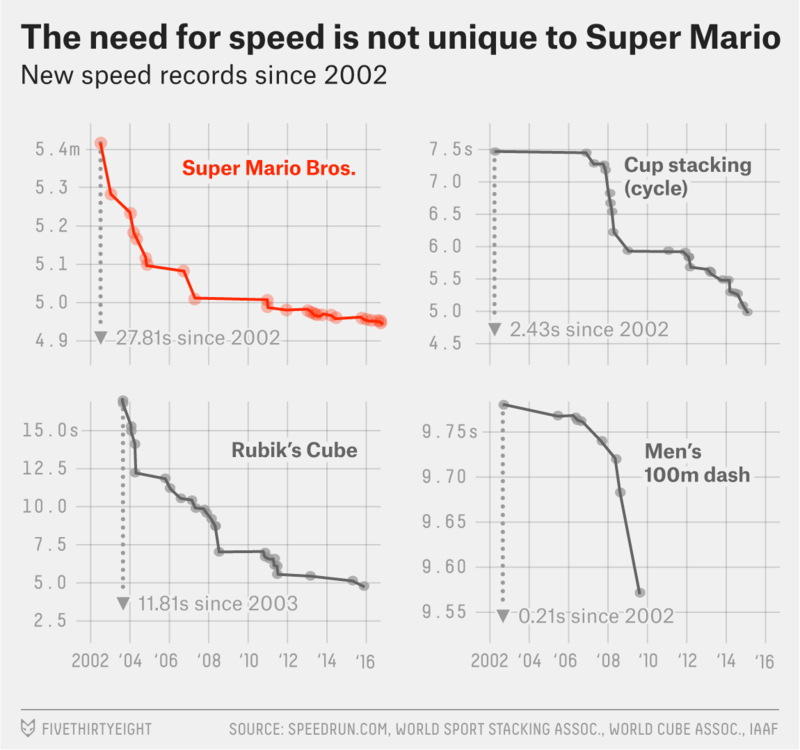 It is entirely possible that, soon after you read this article, someone will go just a little bit faster, and topple the Mario record again. In this 31-year-old video game, there is a full-on, high-speed assault on Bowser’s castle under way right now. Witness the very shape of human progress. Really, this is all Chris Milling’s fault. Milling — known online as sockfolder — is central to the Mario speedrunning community. But he’s not a top speedrunner. He’s a glitch hunter, combing the minutiae of games’ code and memory for tiny edges and passing the details on to his speedrunning friends. Speedrunning is a collaborative and cumulative endeavor, academic and scientific in its ideals and division of labor. There are the theorists, such as Milling, who study the math of what’s possible. And there are the experimentalists, such as Myers, who test the theories in game after callus-creating game. It even has a kind of peer review — viewers on Myers’s Twitch streams have occasionally noticed something interesting, and Myers has incorporated it into his runs. The results are then dutifully recorded, cataloged and published, the canon grows and the record falls. Any civilian who’s beaten the first level of Super Mario Bros. has leapt off a tower of blocks, grabbed a flagpole and shimmied down to glory and even fireworks. But ain’t no speedrunner got time for that. For years, the best tool-assisted speedrun (basically a computer trying to find the optimal route through the game) grabbed the flag through the block at its base — a glitch in the game — bypassing the animation of the descending flag and shaving off valuable milliseconds. Milling, through Herculean Mario due diligence, found a way for humans to do the same. If you were to list recent favorites for the Nobel Prize in Mariology — those who have pushed the plumber’s boundaries the farthest — Myers and Milling would be good places to start. You might also include Kosmicd12, who held the world record during a two-day Myers interregnum, and may yet reclaim it. You certainly don’t want to forget Blubbler, who came out of nowhere to demolish the record back in 2014. He was the first to exploit the “Bullet Bill glitch” — another method to bypass the flag animation, by bouncing off a bullet — in a record run, improving the time by 0.4 seconds. And then there’s andrewg. “He was the Mario god,” Myers said. “No one could touch him. No one could compete with him.” He’s so good he juggled with his hands while beating Mario levels with his feet. The discovery of the flagpole glitch has brought andrewg back to the competitive game. There’s a recent 2-hour, 38-minute video on Twitch of him doing nothing but practicing the first level of Super Mario Bros. and learning the glitch, with Myers audible in the background talking him through the finer points. At these elite echelons of play, things get extra weird. At first, it appears he’s made two small mistakes, bumping Mario into obstacles, leaking speed. But those bumps are the key. By default, Mario runs at 112 pixels from the left edge of the screen. If the bumps are executed precisely, Mario gets pushed to 132 pixels. (You can see Mario’s exact position in the upper right of the gif.) Thanks to a quirk in the game’s memory, this new position allows Mario to go quickly down a pipe to the level’s warp zone, bypassing another in-game animation — a growing vine, in this case. But again, just these tricks are not sufficient. A slow time in the underground section? Reset. Mistime a podoboo? Reset. Bad luck with the Hammer Bros.? Reset. Bested by Bullet Bill? Reset. Reset. Reset. Reset. Reset. Reset. Myers said he doesn’t really watch TV or movies — streaming and speedrunning serve as his substitute. Outside of the game, his time is largely occupied with the quotidian — working as a software engineer, troubleshooting home appliances, working in the yard, fixing leaks and housecleaning. But playing the game helps structure his evenings, he said, and allows him to stay in touch with his friends in that online community, and relax before bed. As for calling it quits? “It will happen someday,” he said. In some sense, traversing the Mushroom Kingdom is no more arbitrary than going real fast across 100 meters of track, or moving one’s hands to sort colorful jumbled squares or an intricate stack of cups. To a subset of humans, these things appeal. And to a subset of them, they can’t but try to do them more efficiently than anyone ever has. I asked Kosmicd12, holder of the second-fastest time ever, what the goals of speedrunning are. “The goal of speedrunning is to go fast,” he said. In the Mario case, there is an element of nostalgia and, yes, even fun. Myers grew up on Mario, and plays his record attempts on his childhood NES console. “But I learned so many new things about them that I never thought were possible.” Kosmicd12, his chief but friendly rival, added: “The core of speedrunning comes down to having lots of fun playing a game you love in new ways and with virtually unlimited replay value.” A preeminent expression of cultural recycling.